Saints extended their unbeaten run to seven league games with a 4-1 victory over the Shropshire side on Saturday. It was a must-win game for Saints if they were to close the gap on fifth-placed Telford, who began the day four points better off. 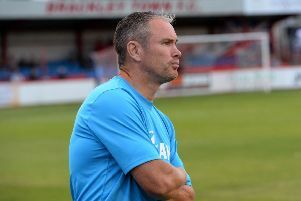 Boss Kevin Wilkin made a couple of changes from the starting line-up from last week’s FA Trophy success with central defender Connor Hall and the cup-tied Carl Baker coming back in. All the goals came in the first half. Saints raced into a 3-0 lead through Jimmy Armson, top scorer Lee Ndlovu’s 17th of the campaign and Baker but Telford pulled one back just before the break through Marcus Dinanga. Saints dominated the opening exchanges and created all the early chances. Gareth Dean glanced a near post header over the bar from Glenn Walker’s inswinging free-kick, Baker fired over from the edge of the box and Matt Lowe advanced into the box before shooting just wide. So it was no surprise when Saints broke the deadlock in the 23rd minute. Lowe exchanged passes with Ellis Myles on the right and when his low cross came in Armson got ahead of his marker to finish neatly at the near post for his 12th league goal of the season. Telford struggled in the final third and a dangerous free-kick from Brendon Daniels which evaded everyone in the six-yard box was their only threat. More good approach play from the lively Lowe saw Saints double their advantage five minutes before the break. Lowe’s trickery took him into the box and his deep cross was headed in at the far post by Ndlovu. And it got even better in the 43rd minute when Ndlovu’s cheeky back-heel found Armson who released Baker and he raced into the box, side-stepped Joe Bursic and slipped the ball into an empty net. That should have been game over but within a minute Telford reduced the arrears when Dinanga got on the end of a ball into the box to beat Danny Lewis with a low drive from 15 yards. Saints even had a chance to restore their three-goal advantage in stoppage-time when Baker cut into the box but Bursic just about managed to keep out his low drive. After the restart, Bursic did well to palm away Adam Walker’s 25-yard drive. But the second half failed to spark into life with Saints comfortably in control of proceedings. Baker cut into the box but Bursic turned his low drive away as Saints began to turn the screw. Telford had to work hard to stay in the game and offered little in attack with Jon Royle’s wayward header going over. Lowe missed the opportunity to get the goal his display deserved when he was released by Glenn Walker but, after getting into the box, he hesitated and allowed the advancing Bursic to push his close range effort away. Lowe went close again late on when he cut into the box but Bursic was equal to his effort. 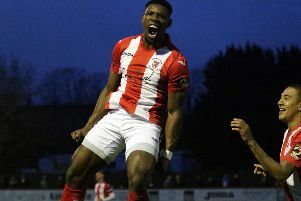 Danny Lewis was finally called into action in stoppage-time in the second half when he turned over Royle’s fierce drive and Daniel Udoh shot into the side-netting but it was all too little too late for Telford.